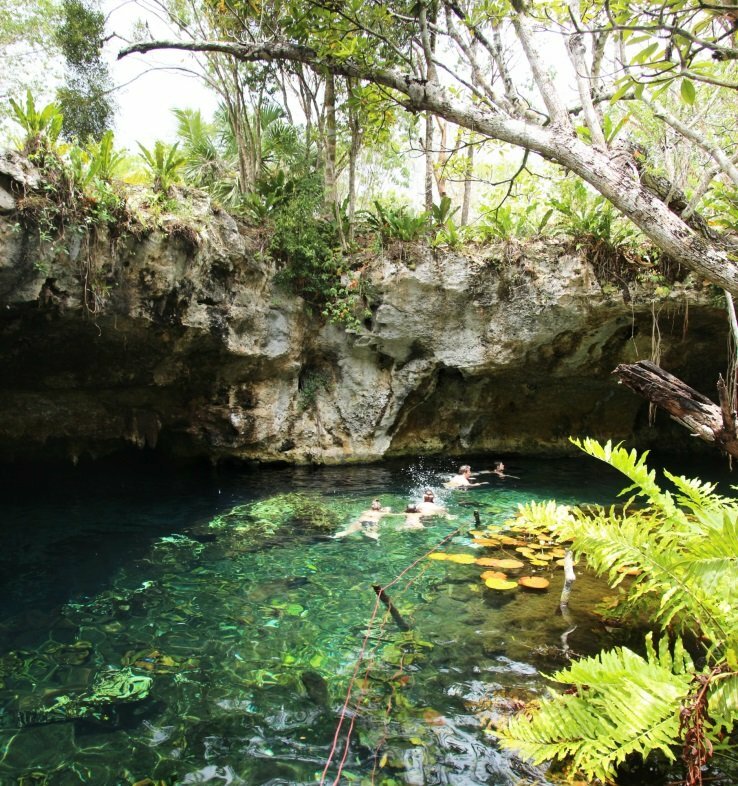 In Yucatan, a province of Mexico, you'll find thousands of cenotes. You can find them in places where there are no rivers. Rain is silt trough the ground and water flows underground to the sea. It is carving and shaping the rocks. Making rivers and underground rivers. Sometimes the lime stone roof collapsed, which created big sinkholes. Other cenotes are open water pools. They all have very clear water. In some cenotes you can make a dive or you can go snorkeling. The fish here are not very diverse, the scenic views and sometimes the massive caves are all beautiful! 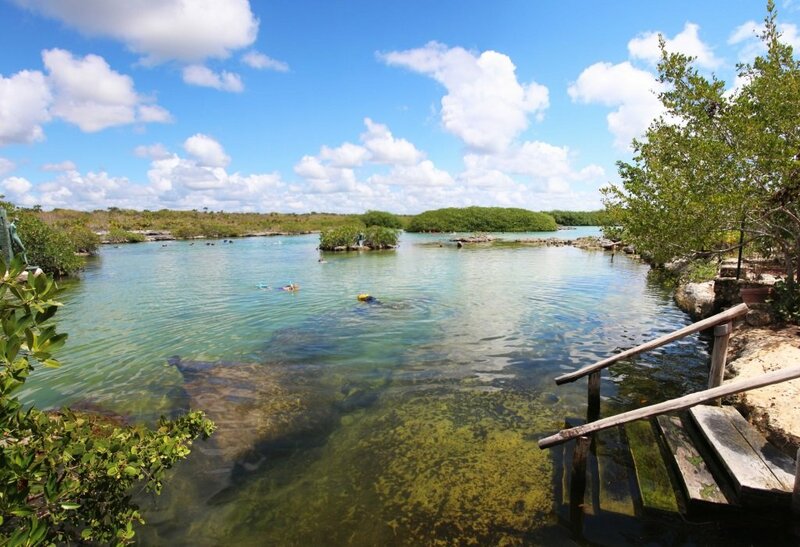 Cenotes are a perfect place to have a refreshment swim on hot days! But which cenotes are the best? Which one to choose? I made a list with the nicest cenotes. The first one we have visited was cenote Zaci. When you walk to the market of Valladolid you'll pass it, since it is right in the town. We didn't swim here, since it was early morning, but the cenote looked nice with some roots hanging from the top. People were already take in a fresh dip. The restaurant, which overlooks the cenote looked nice. Entrance for swimming 30 pesos. But you can take a look at the cenote from the viewing deck at the restaurant. 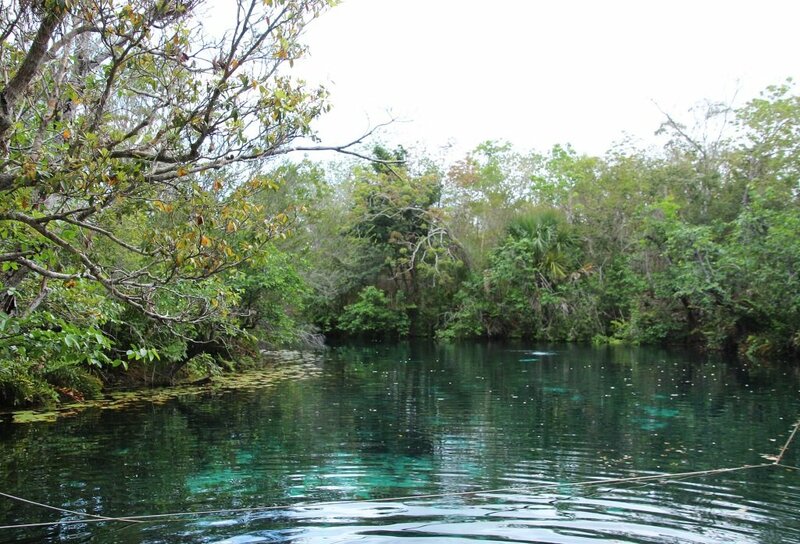 Just a few kilometers from Valladolid you'll find cenote Dzinup and cenote Samuela. 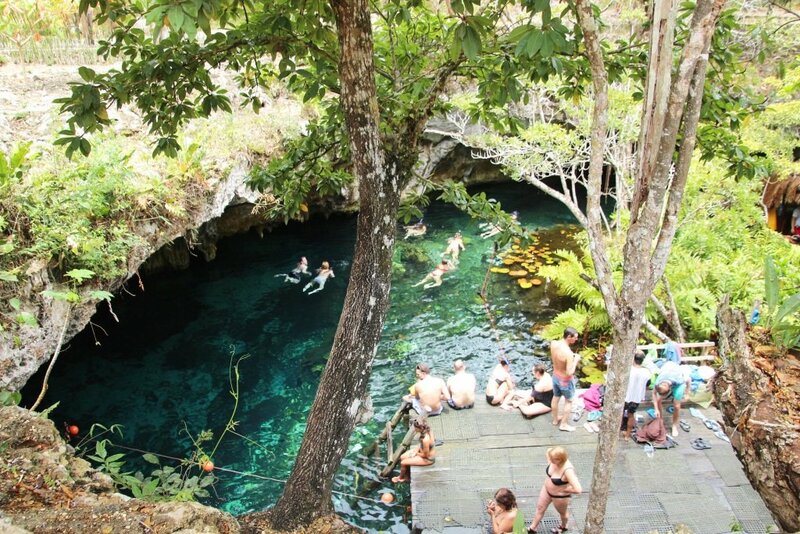 There is one entrance for both cenotes, were you pay the entrance fee. We bought a ticket for dzinup. We entered down the stairs to the cave. This cenote has a small hole in the rooftop. The water lit up clear blue around noon. We were there on a clouded day and around 11 am so we didn't get to see the spectacular light. The water is still bright blue. The cave is huge and the water had a perfect temperature. But since it was Easter weekend it was crowded, overcrowded. So to avoid weekend days or bank holidays. 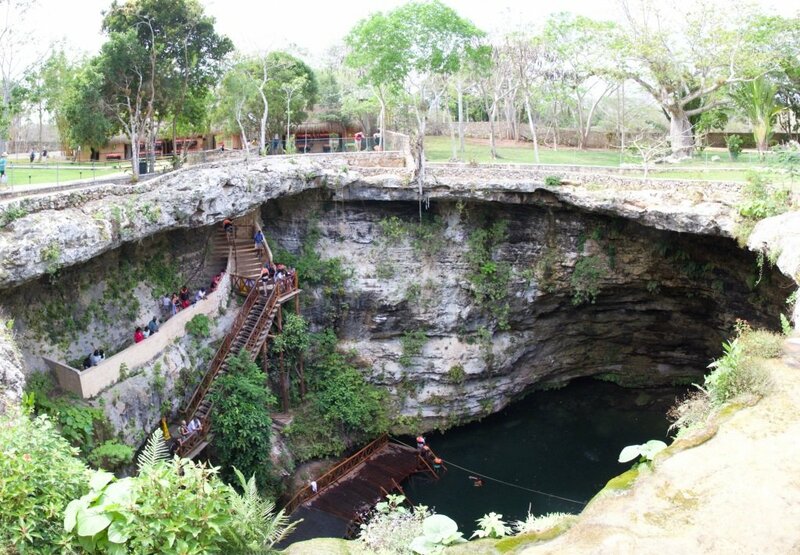 We could take a look from the top of cenote Samuela. There were fewer people here and the idea of cave with a hole in the rooftop was the same. We didn't enter this cenote. Parking is free of charge. There are life vests and lockers available for a fee. 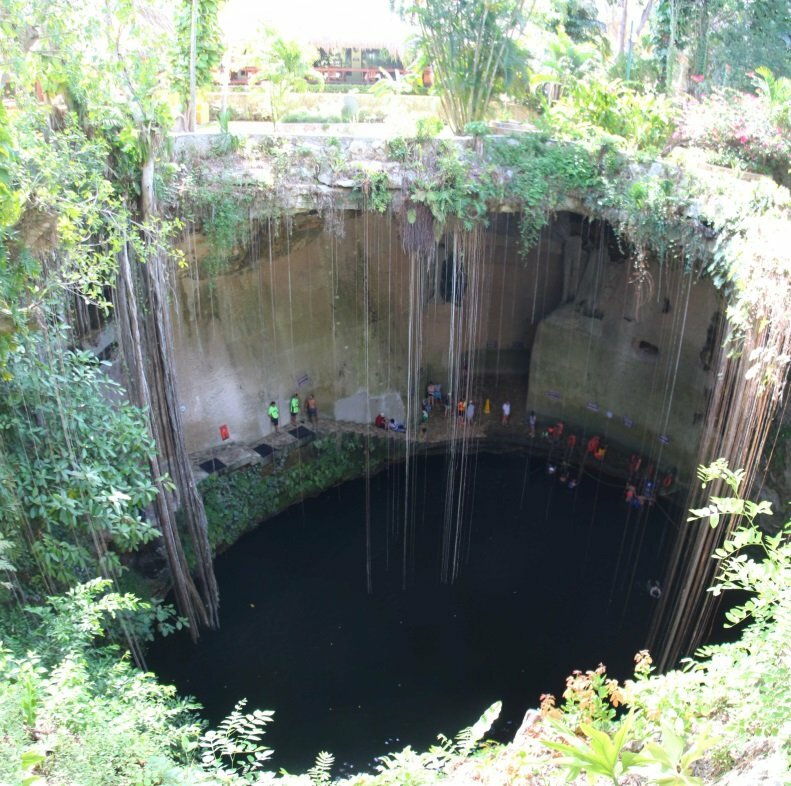 When you drive on route 180 outside Valladolid and on the way to Dzinup cenote you'll find cenote Samaal. It is right at the corner, when you exit to the road of Dzinutp. Enter through the gates, parking is at the end. This place is under construction and far less visited like the close by cenotes Dzitnup and Samuela. The big sinkhole has big roots coming all the way down and they created a few artificial waterfalls. From the platforms you can enter by stairs or if you dare, jump from the higher platform. Dressing rooms and lockers were free of charge, the same for life vest, which you were required wearing. I loved this cenote because there were only a handful if people and it just looked nice with the set up garden. 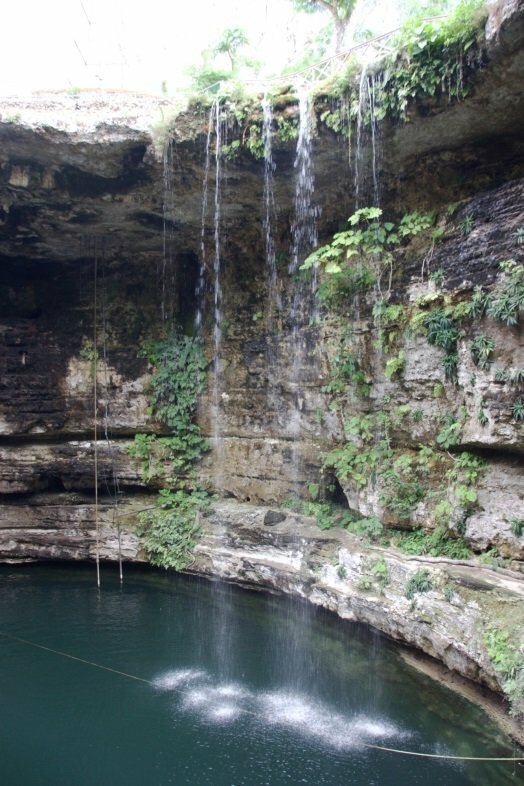 Along the way from Valladolid to Chitzen itza you can make a refreshing stop at cenote Ik Kill. With the beautiful roots hanging from the top I think this cenote is pretty. But also over crowded. It opens at 10. When we arrived at 10.15, there were already a lot of people. There are jumping platforms for the dare devils. The light is just about to get in around that time, so it felt a little dark. Live vest, lockers are provided for a fee. Parking is free of charge. Along the way from Tulum to Coba there are several cenotes. 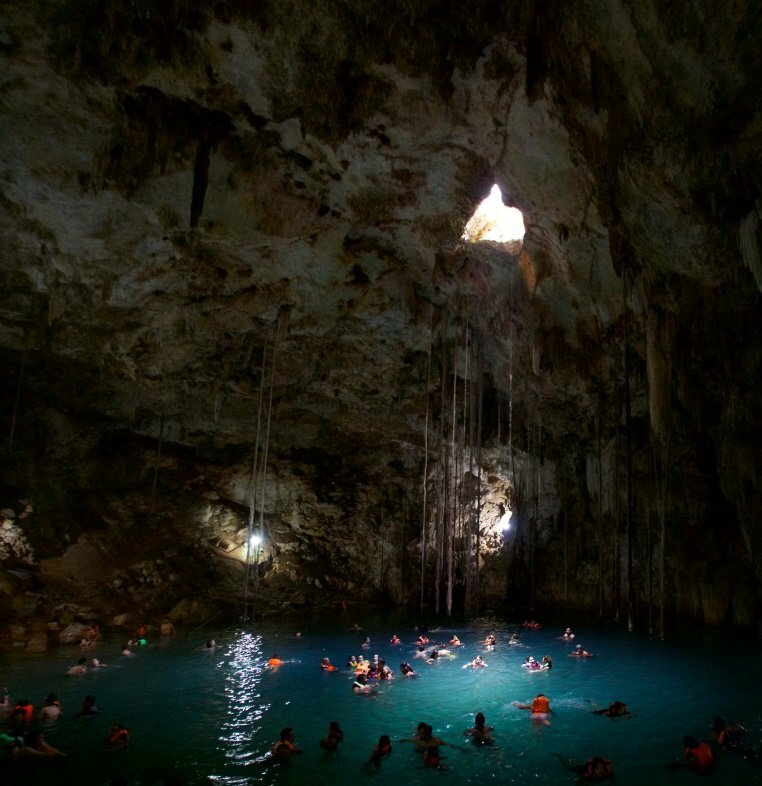 Grand cenote is the most visited. This cenote has a big sinkhole for swimming. In the middle they build a platoon. Here you can rent lockers and life vest. It was a little raining when we arrived, but the color of the water was blue and the water was clear. Some turtles and fish are around. If you follow a line, you can swim trough a cave. On the other side the cave is bigger. Look up at the ceiling and you might see baths and birds which make a nest between the rocks. I think this cenote was beautiful, but busy! Not much space for swimming. I just loved the color of the water! This was my favourite cenote, even though it was crowded. This cenote is also known as car wash. People actually washed their car at this spot, as it is so close to the road from Tulum to Coba. Nowadays you can go snorkeling and diving. This open pool has clear water. Going in the water cost 50 pesos, but if you only want to look or take a picture it's for free! It was cloudy when we got here and we were actually on the way to zak zulik which suppose to have good snorkeling. I still regret not going for a swim, as it supposed to be much better as it looks from the surface! 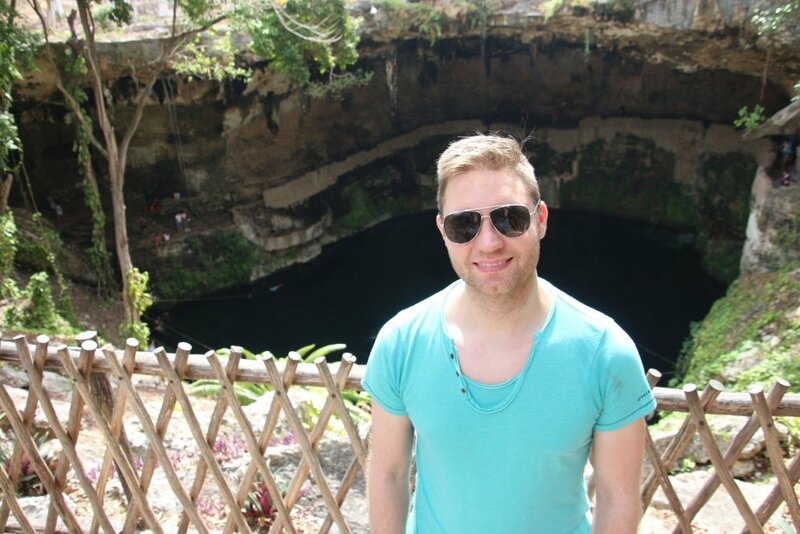 Next to Aktun cenote you'll find Zak Zukil. The lonely planet guide referred this as a great snorkeling and diving spot. Well, it isn't! 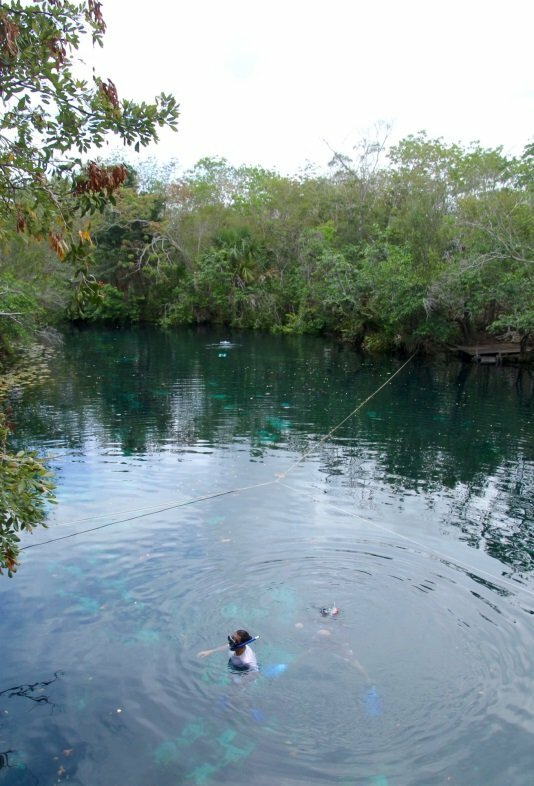 This cenote is a small hole where you can get in the water with a zip line, at additional cost. Although the area has a nice set up with a restaurant, a swimming pool and cabins for rent, I found this place least attractive. The cenote was small and it wasn't good for snorkeling. We did have a nice lunch at the restaurant! 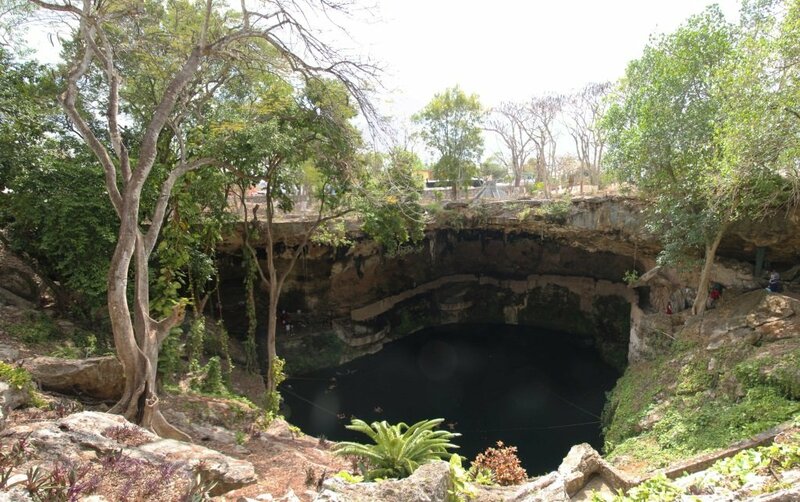 On internet I heard great stories about cenote Dos Ojos. 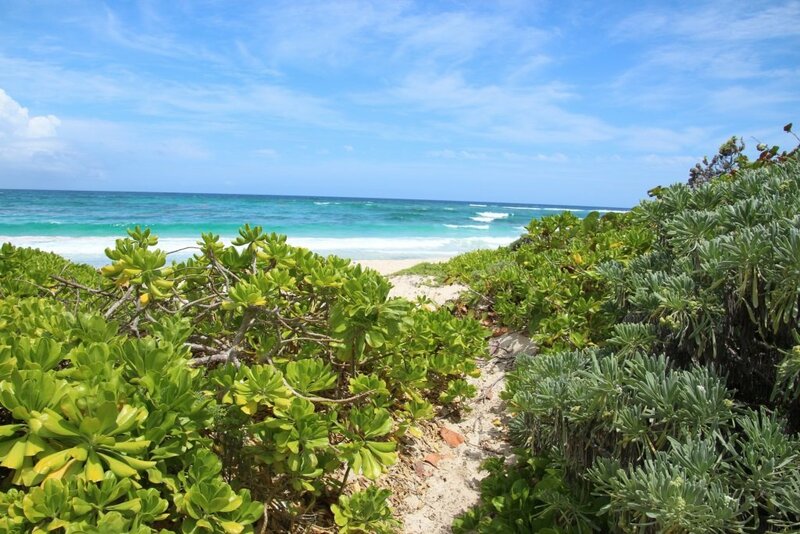 It is along the way from Akumal to Tulum. We parked the car to found out the entrance fee is really steep with 350 pesos or with a guide 600 pesos. You'll visit 2 cenotes for that price. 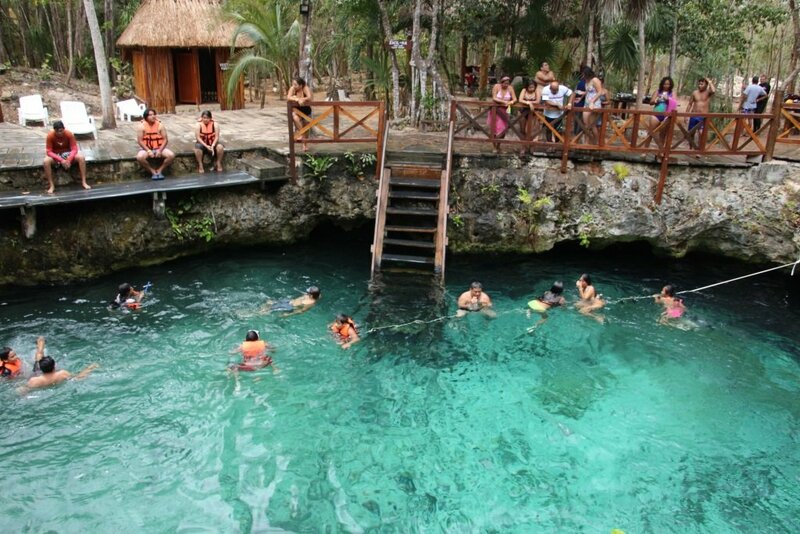 We looked at the pictures displayed at the entrance and decided we prefer to visit other nearby cenotes for less money. Entrance fee 350 Pesos or 600 Pesos for a guided tour. From our accommodation Maya Eco resort, we got the tip to visit the less visited secret beach. From the parking lot it is about 500 meters to the cenote. Along the path, which is lush and green, you sometimes have a view from the sea. Since this cenote is small you have to wait until people leave to make some room for others. 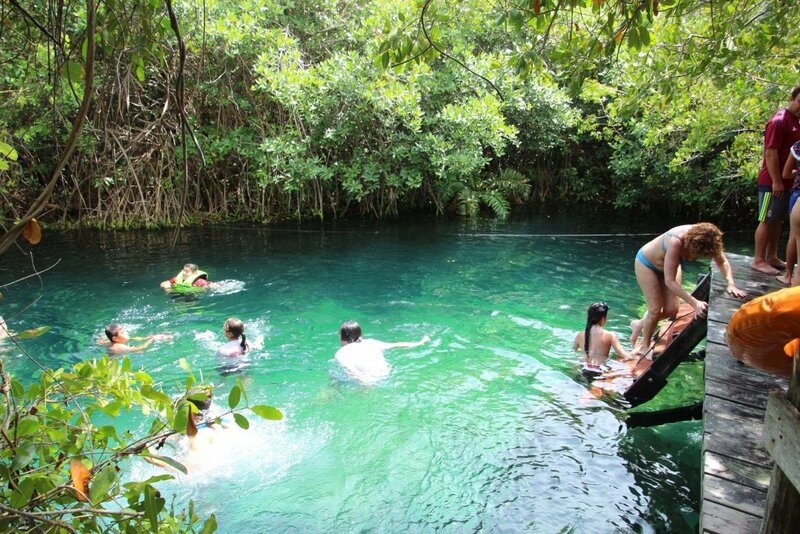 The water had a green color and the cenote is between the mangrove forest. This water is salt. It was a lovely walk to the cenote, and it looked nice. If you finished snorkeling with turtles in Akumal, continue the road along the beach to Yal-ku cenote. 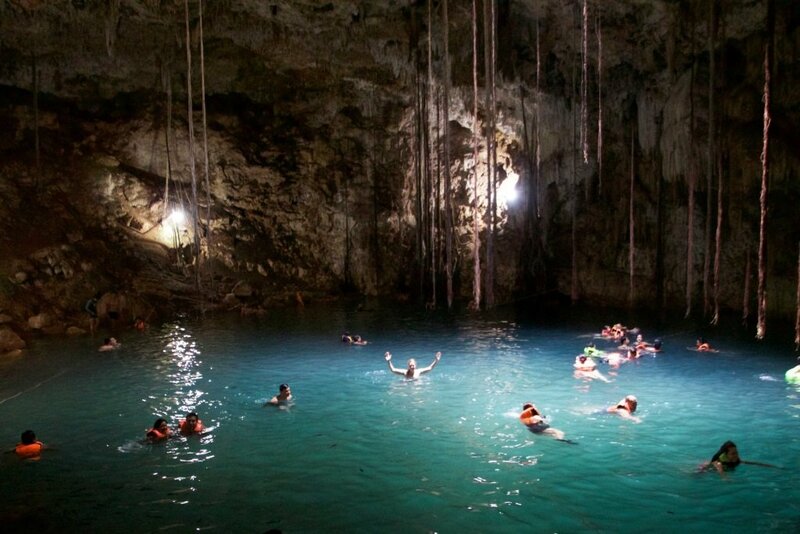 This cenote is protected from the rough seas, therefor ideal for snorkeling. It is connected to the sea and you can find all kind of fished between the mangroves and by the rocks. I think the water was a bit murkley. But around the mangroves we could see some nice fish. The scenery is nice and there is a good value restaurant at the site. Prices are affordable. Overall, I think the entrance fee is too high and I would’ve skip this cenote. Parking is available without charge. Life vest is at addition cost.